Formed from the soft tissue of a shelled mollusk, pearls are made up of layers of calcium carbonate. Pearls should ideally be round and smooth, but many other shapes exist. The finest of pearls have been considered gems and are looked on as things of great value, beauty and rarity. The Pearl Source is an example of a company that distributes pearls in the form of necklaces, earrings, pendants, bracelets and rings. The necklaces, for example, come in several different milliliter thicknesses. Earring studs may come in different colors and shades to match different decor or outfits. This company has been in business for over 20 years and is one of the largest wholesalers of South Sea pearls. Pearls from Japan, Tahiti, the Golden South Sea and the White South Sea are all available for purchase and design. Tahitian South Sea pearls are known for their exotic color and luster as they contain a very wide spectrum of color from peacock green to blue to eggplant. This specific type of pearl is produced by the Pinctada Margaritifera oyster and has never been treated or enhanced in any way. White and Golden South Sea pearls are made by the silver or golden lipped oyster and are found on the shores of Australia, the Philippines and Indonesia. They are quite rare and hard to find in most jewelry stores. A 100% money-back guarantee is offered and free shipping with UPS Ground is available. Also available is UPS 2nd day and overnight shipping. Most pearls will be found there at up to a 75% off price savings. This is possible because the gems are imported directly at wholesale prices. Customer satisfaction is maintained by offering a 100% refund to customers who are not completely satisfied with their purchase in the first 60 days. The entire purchase price is refunded to the customer for any reason within this time period. Orders can be placed live by the using the toll-free number in the U.S.A. Products can be sorted by price, by type of product, grading, sizing or length. Unisex, loose pearls, and tincup jewelry is also available for purchase. 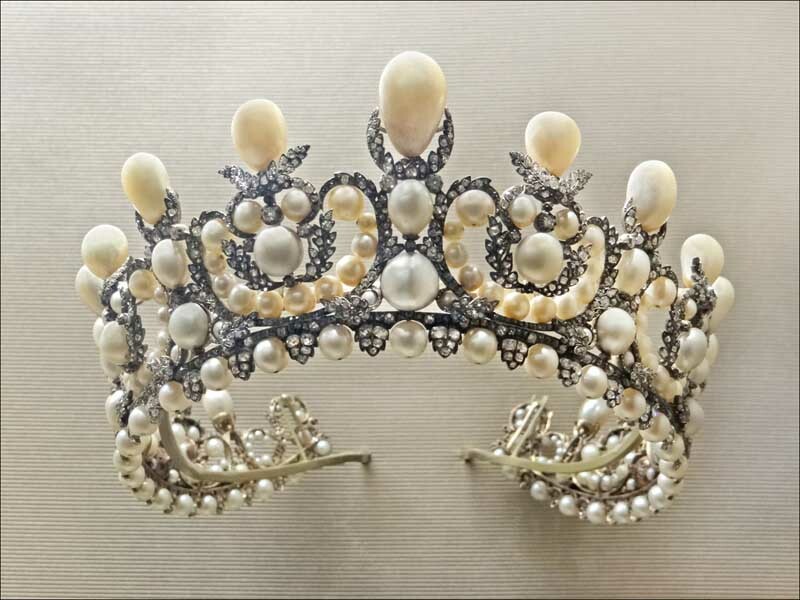 Photo: Pearl tiara of Empress Eugénie (1853) featuring 212 natural pearls, Louvre, Paris.